Teresa Kohl’s path to becoming a Forest Grove community service officer began in 2006 when her daughter, Megan, was murdered. “Everything about me changed through that experience,” Kohl said. “I swear to God, even my DNA changed. After Megan’s death, Kohl found herself incapacitated. Simple tasks were now impossible undertakings. Even trips to the grocery store became a challenge. “I really wanted something to give me focus, where I could make a difference,” she said. She found what she was looking for in the Forest Grove Police Department. But it wasn’t an easy start. After arriving at the FGPD on Cinco de Mayo, 2008, Kohl said, “no one called me by name for six months. I felt very alienated there. It’s a tight group. Several of her colleagues had high praise for Kohl, who is retiring this week. “She is an incredibly devoted person who truly cares about the people she works for and the people she works with,” said Capt. Kevin Ellingsburg, who also calls Kohl “ridiculously fast with a camera,” referring to her side job as a freelance photographer and the photos she’s taken of department events. But her years of dealing with everyone from illegal parkers to hoarders, addicts and homeless people are coming to an end. Now 66, Kohl will work her final full day today, July 8. COURTESY PHOTO – Teresa Kohl started work with the Forest Grove Police Department in 2008, when she was looking for a mission that would give her life purpose again after her daughters murder two years earlier. Kohl was hired with no police or institutional background. “I think I was the only one who correctly spelled ‘security’ on the application,” she joked. But she had mediated in Washington County courts for years and it was that experience that gave her enough credibility to be considered for the position. Though the job called for only 20 hours per week, she typically worked 35 to 40. “It’s more like, what work have I not done?” said Kohl, who has handled parking and code enforcement, spoken to Boy Scouts and other groups in safety presentations, counseled hoarders and much more. Ellingsburg particularly cited her success with the Neighborhood Watch Program. When she started, there were seven active Neighborhood Watch groups out of 33 designated for the city. Now there are 28 active groups in the city. Kohl feels one of her greatest accomplishments was helping “Patty,” a woman whose hoarding tendencies almost landed her on national TV. In her late 30s, Patty inherited a house on Camino Drive after her caregiving client died and left her the property. But Patty’s hoarding tendencies took over. Years later, the home was physically falling apart and so packed with junk that people could barely walk through it. Patty herself was sleeping in a tent in the back yard. Wire fencing, parts of bicycles, a van that didn’t run, boxes of bottles, vases and jars — a literal trash pile was swallowing the home. As the garbage grew, so did complaints from neighbors, said Kohl, who decided to intervene, spending time with Patty to earn her trust and help her start cleaning up the property. But progress was so slow that Kohl finally contacted the producers for the A&E television program “Hoarders.” The program doesn’t just show shocking footage of junk-filled homes, but offers professional organizing and counseling help. The producers were interested, but when Patty found out her face would appear on national TV, she backed out. “My goal was to help her out of this mess, but it was too big for me — too big for her,” Kohl said. Ultimately, with help from her church, Patty wound up selling the house “as is” to someone who fixed it up and sold it for a higher price. “My reward is when I feel that I’ve made a difference, or even made someone smile for a minute,” Kohl said. Because of how she approaches life, Kohl doesn’t believe that she could maintain the constant on-alert composure that is required from police officers, whose mantra she describes as: Be suspicious of all, trust no one. She chalks up her unguarded, disarming approach to a lack of preparation for the position when she applied. 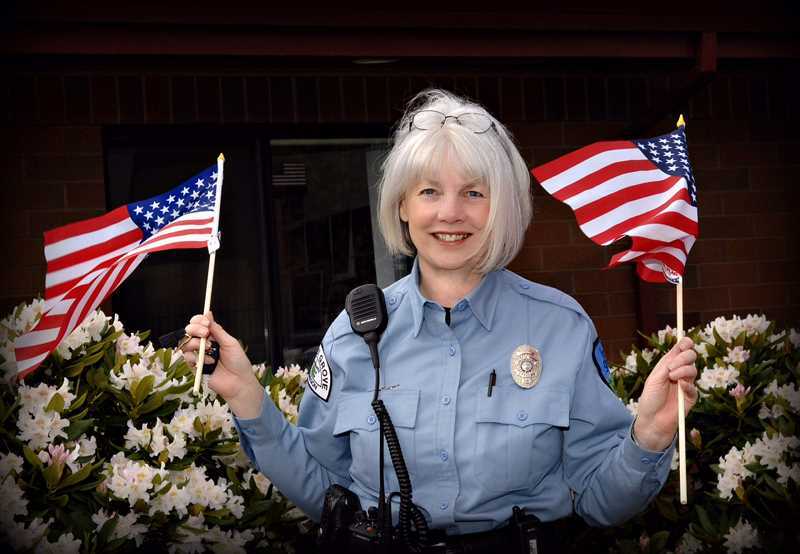 While sworn officers with their uniforms and weapons can be somewhat intimidating, Kohl’s desire to be down-to-earth enough to connect with people at all levels has put her in harm’s way more than once. She forgot to check for a weapon when trying to calm an erratic man at city hall, for example. Another time she faced down a charging pit bull, which — fortunately — ended up being friendly rather than vicious. And she approached a woman with dementia who had escaped her caretaker and become volatile inside the downtown Wells Fargo bank. With such risks, Kohl understands how lucky she is to have made it this far without incident. Now it’s time to focus more on her family. She’s got a 32-year-old son who lives in Texas and studies the blood viscosity of alligators. And she has a 92-year-old mother in Missouri who suffers from dementia. That’s where she’s headed as soon as she leaves. She’ll miss her colleagues. “There’s a heart that beats in that department that’s made me feel very protected, like I contributed — like I made a difference. “Leaving this job is just leaving a huge hole in my heart. I won’t have a focus anymore,” said Kohl, who plans to come back to Forest Grove, even if she can’t have her old job back.